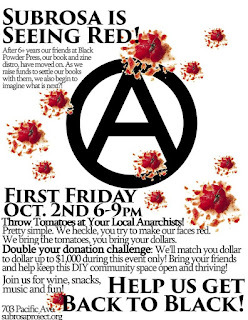 SubRosa - a community space: 1st Friday Benefit! What Is Anarchism? Sneak Peek! Other Happenings! 1st Friday Benefit! What Is Anarchism? Sneak Peek! Other Happenings! 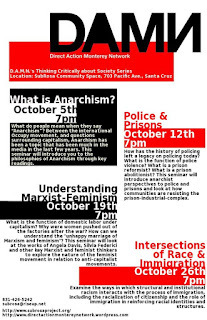 We at SubRosa are thrilled to have folks from Monterey that are a part of The Direct Action Monterey Network (DAMN) come to Santa Cruz to host a series of discussions at the space. From their website: "DAMN is a forum for anarchists, feminists, socialists, and other anti-authoritarian revolutionaries in the Monterey/Salinas area to find each other, discuss ideas and news, and take action! Fellow travelers, sympathizers, and supporters are welcome!" What do people mean when they say “Anarchism”? Between the international Occupy movement, and questions surrounding capitalism, Anarchism has been a topic that has been much in the media in the last few years. This seminar will introduce you to the philosophies of Anarchism through key readings, and then use these philosophies to discuss current events. 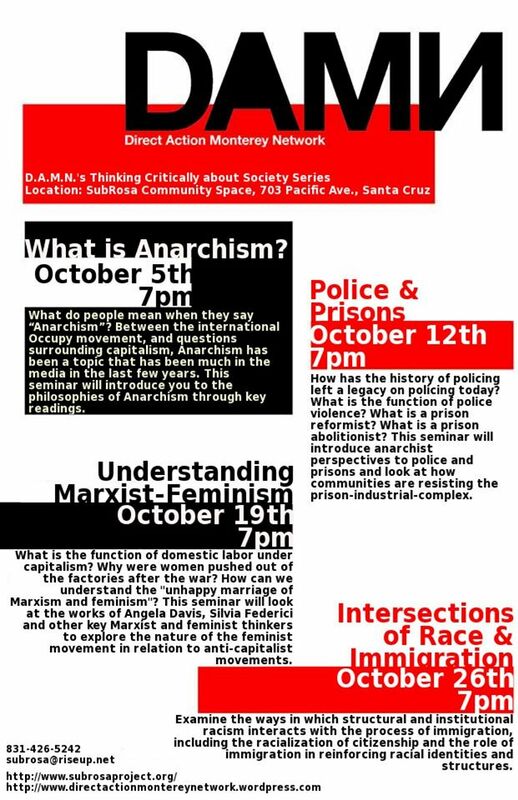 The Public School: Santa Cruz has info about upcoming meetings for the revolutionary-feminism reading groups at their facebook page. https://www.facebook.com/The-Public-School-Santa-Cruz-957872817618243/timeline/ "The Public School is free education. Community-supported and learner-directed, the Public School is open to anyone. Our school takes an educational model of autonomously organized classes, events, and working groups, while providing a point of connection and interaction between ongoing projects in Santa Cruz."